COAR raises children with love and security, school and health care, fun and responsibility. But the ultimate goal is to prepare them to be good parents. There is nothing more important, as the story, right, from The Economist, points out. Children and youth without family, dignity, education, skills, or hope, turn to the gangs. Parents too impoverished to help their children cannot prevent it. COAR gives children hope. It prevents the gang problem from starting in each of them. It gives them the strength of their COAR family. For those that live at COAR with siblings, (pages 4 & 5), it allows them to grow up together, supporting each other, and stay a family as they move into adulthood. The gang problem in El Salvador, and everywhere, can be healed. You do it with every gift. More gifts allow us to help more children, and help them with more caring and skilled staff. The cost of this kind of support is high and always rising. But the investment pays off – El Salvador’s only resource is its people. “ . . . the only resource El Salvador can exploit is its people,” says Mr Cruz. 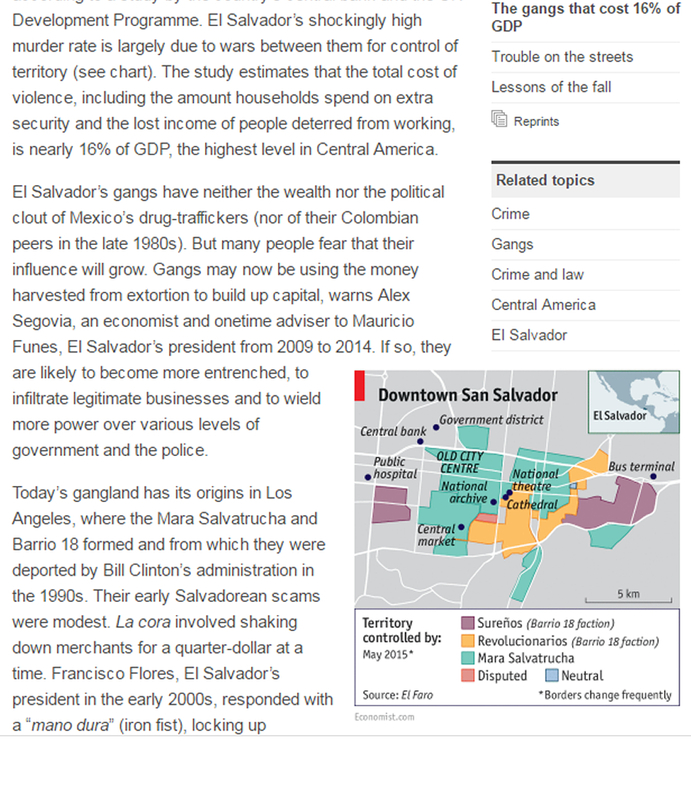 The 12-year war between El Salvador’s right-wing government and leftist guerrillas, which ended in 1992, had left excombatants without work, assault weapons . . .
. . . the authorities have sought to regain control of territory by using such means as evicting gangsters with rapidresponse battalions . . . A better approach, say human-rights groups, would be to provide actual and potential gang members with skills and jobs. . . . In a country where a quarter of people aged 15 to 29 are neither working nor in school, that is hard. The government has spent little money on programmes . . .